Ball Lightning (2018. 384 pages) is a hard science fiction novel, by the Chinese writer Cixin Lui. The book was originally published in Chinese in 2005, but this is the first English translation. Praise should be given to Joel Martinson, who also translated one of Lui’s original trilogy, for making what could have been a book filled with densely packed scientific postulations eminently readable. The protagonist, and our POV character is Chen, a child at the beginning of the book. 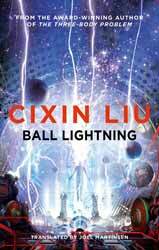 On a stormy, but otherwise normal night Chen witnesses a ball of lighting which appears in his house and instantly kills his parents when one of them accidentally comes into contact with it. Rather than being horrified, it sparks a deep desire for knowledge of the rare phenomenon. He devotes all of his studies trying to understand how and why it existed and why it behaved in such an unusual manner. The book slowly unravels the nature of ball lightning which has profound implications for the world. For anyone who has previously read Lui’s Three Body Trilogy, the book may have some of its mysteries spoilt as it also works as a prequel to the trilogy and some of the characters in this novel also appear in the latter books. The first half of the book is a bit of a slow burn, as Chen pursues his studies, in parts encouraged, especially by the military, who sees a potential weapon in his research and fellow academics who wish to dissuade him, either from altruistic reasons or because of their own personal failures. However, when the big ideas happen they take the book in an incredible direction, which challenges the way you will look at the world. I’m not qualified to say how much of the science is only speculative, in the first half of the book, but it is presented in such a persuasive manner that it feels very real. Of course, in the second half of the book the science veers seriously away from known fact, but because the foundations are well laid, it also feels eminently possible. The book does contain a lot of technical information, but it delivers it in a very comprehensible and understandable manner as it challenges the readers view of cosmology, challenging our place in the universe. With this being the first translation into English this book is likely to be a good contender for one of the many science fiction awards this year. The story does have a few niggles. Lin Yun is probably the most interesting character, a female with an unusual obsession with weapons. For most of the book this remains a floating mystery through the story and it should have stayed that way. Instead Liu devoted pages during the penultimate section to explaining her whole past which interrupts the final reveal and denouement. Also, the book is heavy on dialogue, which personally I found fine as the story is set in the very near future, so world building is not really an issue. Ultimately, this is a book which delivers a real WTF ending, satisfying and a little scary.